Ozhotels is a directory of non-related and independently owned hotels, apartments and resorts providing accommodation in Palm Cove, Queensland, Australia. Oz hotels allows you to deal directly with these Palm Cove holiday apartments and hotels, thus giving you the best possible discount rates for this Palm Cove accommodation. Why look elsewhere for your next family holiday when you can compare and book your Palm Cove accommodation directly online with the hotels and save save save!!! When you next decide to have a holiday in Palm Cove you will quickly see that there is a wide variety of place in which to stay. These range from fully self contained holiday apartments and resorts through to hotels and budget motels. This extensive range will make choosing the most appropriate accommodation in Palm Cove a time consuming and difficult task and this is why so many people prefer to use the services of an accommodation expert like OzHotels to help them find the right place. Doing this you will be able to compare lots of different properties that are located right across Palm Cove, ensuring that you get the property the meets your requirements and travel budget. The advantages of using OzHotels is that you will be able to book up to 12 months in advance and that you will get an extra discount off the already cheap rates for longer holidays. So why not book your next holiday to Palm Cove directly with OzHotels and save yourself lots of time and money. The central location of the Beachview Apartments at Villa Paradiso Resort means that holiday makers are just a few metres from the beach and the Coral Sea. The Beachview Apartments at Villa Paradiso are the essence of Palm Cove accommodation, occupying an absolute beachfront position amongst the giant Melaleuca Paper Bark trees and Palm Trees. 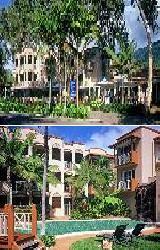 The Villa Paradiso Apartment Resort is located on the Esplanade in the heart of Palm Cove, close to award winning restaurants, shops and cafes. This Palm Cove accommodation offers a choice of luxury 1, 2 or 3 bedroom self contained apartments facing the beach with expansive ocean views from the private balcony. A heated swimming pool, childrens pool and spa are in a sheltered area of the property and there is even free broadband wireless internet access for guests. Further resort facilities include BBQ area, laundry service and FREE car parking. Attractions within easy reach of these Palm Cove apartments include Kuranda, Daintree World Heritage Rainforest, Skyrail Rainforest Cableway, Great Barrier Reef tours and Cairns Tropical Zoo. The Oasis at Palm Cove Australia is twenty minutes North of Cairns International Airport offering a unique mix of casual ambience and world class facilities in the picturesque beachside village of Palm Cove. Located only 80 metres from the beach and 150 metres from Palm Cove Village, stay in our luxurious and fully self contained apartments and suites as you soak up the relaxed and friendly hospitality. An exclusive apartment complex, Oasis at Palm Cove occupies its own quiet cul de sac and the garden and recreational areas form approximately 70% of this luxury Palm Cove accommodation. Ideally positioned on the beachfront of beautiful Palm Cove the Melaleuca Resort Apartments is a small holiday property that features one bedroom holiday apartments with all of the conveniences of home. Whether your idea of a perfect vacation is soaking up the sun on golden sand beaches, snorkelling and diving the Great Barrier Reef, golfing on world class links or discovering the Daintree Rainforest, Melaleuca Resort can provide you with your perfect holiday experience. Palm Cove, which is the Spa Capital of Australia, is only 20 minutes drive north of Cairns Airport and is close to the Great Barrier Reef, Daintree Rainforest, Kurunda Skyrail, Atherton Tablelands and a raft of outdoor activities including bungee jumping, hot air ballooning, horseback riding, sailing and sea kayaking. The Melaleuca Resort Palm Cove Apartments has been recently refurbished and boasts large modern units with a relaxed tropical feel. Relax and rejuvenate in the award winning salt water lagoon style pool, spa baths, games room, library, sauna and BBQ facilities. Or stroll back to the hotel along the sand while the surf rolls lazily onto the beach nearby. The Alassio Palm Cove Holiday Resort has something to offer everyone with a selection of self-contained luxury holiday studio, 1, 2 & 3 bedroom serviced apartments which are located right on the Palm Cove beachfront overlooking the beautiful Coral Sea. These Palm Cove apartments have been crafted around ancient melaleuca trees, coconut palms and a freeform lagoon pool, and all of the apartments have private spa baths and fully equipped kitchens. The Alassio Palm Cove Apartment Resort is ideally positioned at the northern end of the beach, within 5 minutes walk of golf, beach swimming enclosure, great shopping, nine bistros, restaurants and bars & Palm Cove village shops. Guests staying at Alassio On The Beach can relax in the lovely tropical garden setting complete with large waterfall flowing into the saltwater lagoon swimming pool. The guest facilities at this property rival luxury Palm Cove hotels with an elevated outdoor heated Jacuzzi, children's pool, BBQ facilities, entertaing area, direct beach access, restaurant, bar, free car parking, guest laundry, airport shuttle, cot hire, laundry service, WiFi access, tour information and complimentary tour booking service. 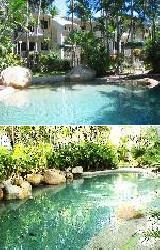 The location of the Palm Cove Tropic Apartments is in a secluded area near some of the best properties in Palm Cove. Situated only 50 metres walk from the most beautiful of Cairns Northern Beaches the charming Palm Cove beachside village with its cafes, bars, boutiques and world class restaurants are just a short stroll away. The resort facilities at this quality Palm Cove accommodation includes a free-form swimming pool surrounded by giant melaleuca trees, a large undercover barbecue area and a spectacular rainforest area adjacent to the property. All of the fully self-contained apartments have been tastefully furnished with quality furniture and feature separate bedrooms, lounge, dining room, full kitchen & laundry facilities, air-conditioning and ceiling fans in each room. These is even a spacious balcony or patios which overlooks the rainforest or the swimming pool & lush gardens. 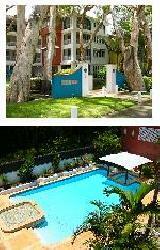 Great value Queensland holiday apartments in Palm Cove. The Villas Apartments in Palm Cove comprises of one and two storey completely self-contained apartment style Villas which take advantage of all the tropical atmosphere while providing holiday makers with every modern and luxurious amenity. The 2 and 3 bedroom Villas offer families and groups of friends with affordable Palm Cove accommodation, whilst the Oasis Villas have the added luxury of their own private swimming pool. The Villas Apartments Palm Cove also provides a large and pristine 17 metre swimming pool and heated spa, Barbecue areas with swaying palms and private courtyards. Located just 20 minutes north of Cairns the Villas Apartments Palm Cove offer holiday makers a relaxing atmosphere in lush tropical surroundings and is an ideal haven from which to explore the scenic beauty of the Daintree Rainforests, the Great Barrier Reef and the surrounding beaches. The Elysium Apartments in Palm Cove is one of Palm Cove's newest luxury holiday apartments and combine high style and practical accommodation options for the discerning holiday makers. Located just 200 metres from Palm Cove Esplanade the Elysium Apartments has superbly decorated studio, 1, 2 and 3 bedroom self contained apartments which all feature spacious, open plan living areas with large private balconies, ultra modern kitchen and Broadband internet access. The Elysium Apartments Palm Cove also includes a stunning outdoor pool deck area, tour booking desk and undercover secure parking. These beautiful, modern Palm Cove accommodation apartments present a comfortable and wonderfully convenient holiday choice that are only a short stroll to the award winning restaurants in the Palm Cove village. Whatever your holiday pleasures the Elysium Apartments is what tropical dreams are made of. History and tradition are still an integral part of the Reef House & Spa Hotel Palm Cove where the lighting of the candles each evening signals complimentary punch is being served in the renovated Brigadier's Bar. The award winning Reef House & Spa Hotel is the premier boutique resort in tropical North Queensland and provides the ultimate in luxury accommodation in Palm Cove. The spacious apartments and suites have been luxuriously refurbished to provide a haven to relax with cool, white washed walls, oversize beds wrapped in crisp sheets and draped in light muslin netting, warm teak furniture and wide verandahs ensure your next holiday is a truly memorable experience. Extensions to the renowned Reef House restaurant have expanded the undercover outdoor dining pavilion and incorporates a stylish new bar and lounge which is set in an exquisite tropical surroundings overlooking the stunning Coral Sea. 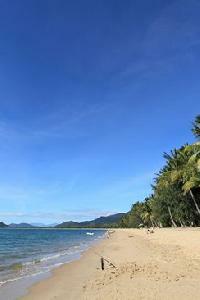 As a luxurious holiday destination Sanctuary Palm Cove is an experience of seamless quality. Situated in the sea-side resort village of Palm Cove, Sanctuary provides a private and secluded retreat only 100 metres from Palm Cove's beach, restaurants and village centre. At this luxury Palm Cove accommodation guests can swim in the 25-metre lap pool along with a spa, children's pool and BBQ facilities within the tropical lush surrounds. The 2 & 3 bedroom apartments at the Sanctuary Palm Cove have private balconies, fully equipped kitchens, air-conditioning and cable TV.